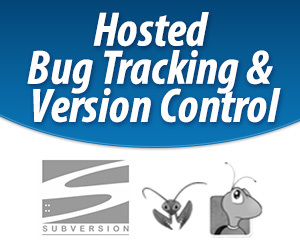 Bugzilla administrators are often asked to set up products that only a limited number of users have access to. This is very true in professional service organizations where the internal team needs to see all the bugs, but the individual clients should only see the bugs related to their project. For example Wonderful Websites is a web design firm that builds custom websites for other companies. Currently they are building a site for Alice’s Restaurant and a site for Bob’s Garage. The designers, programmers and project managers for Wonderful Websites need to see all the bugs for all projects. 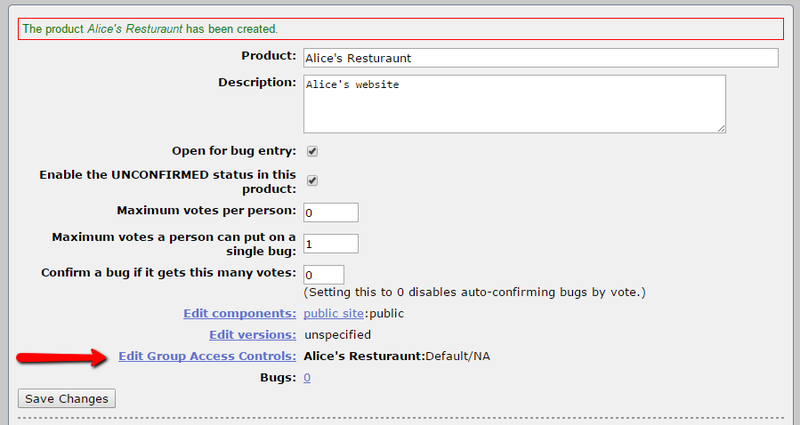 Alice should only see the bugs for the Alice’s Restaurant project and Bob should only see the bugs for his website. There are a number of steps required to make Bugzilla behave this way, but it is definitely possible. The core concepts we need to deal with are Products, Security Groups, Group Access Control and Users. Bugzilla uses the Product as the key to gaining restricted access. In other words you can grant or deny access for a user to a product. In our example we will have two products: Alice’s Restaurant and Bob’s Garage. First off set a couple of global settings. These settings prevent users in one product from seeing bugs and users in another. Navigate to the group security page. Find the setting makeproductgroups and ensure that is is On. Next find the usevisibilitygroups setting and ensure that it is On. This setting prevents someone in group A from seeing the people in group B. This is especially important if you are letting multiple clients view and/or edit their bugs. Finally find the strict_isolation setting and ensure it is On. Now click the Save Changes button to make these settings go into effect. Navigate to the edit bugs group. Enter the name and description. Matching Product and Group names makes it easy to keep track of what Group goes with which Product.. 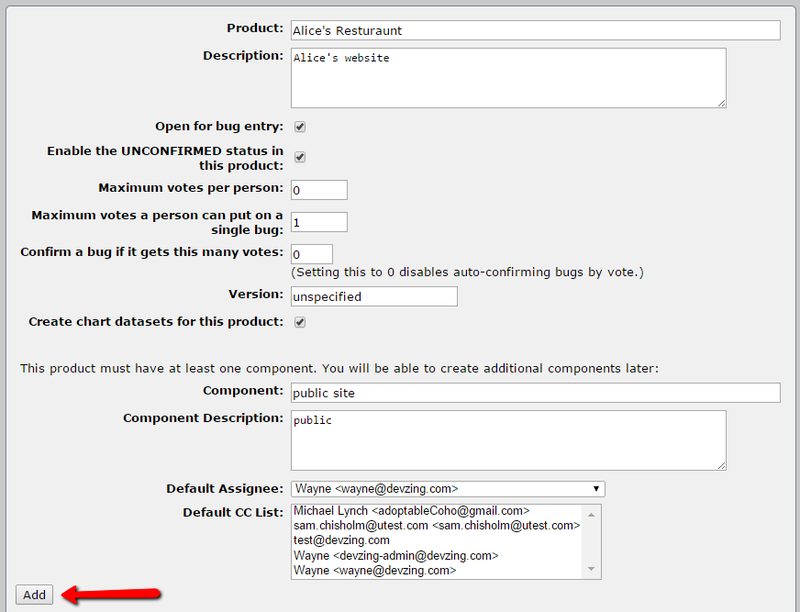 Enter the component name and description. 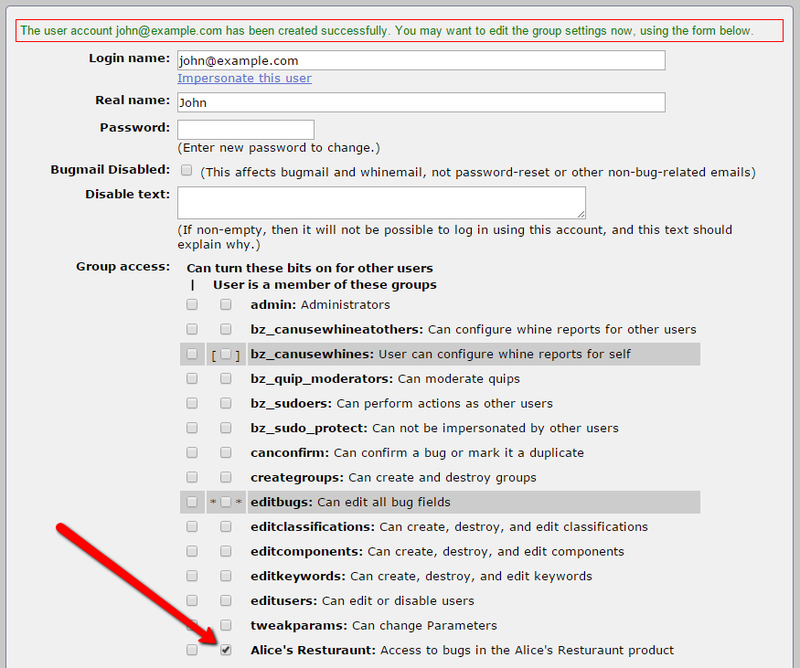 Change the default Assignee to someone in the correct group. Change the Default CC List to someone in the correct group or leave none selected. After clicking add the product will be displayed again with additional options. Click the Edit Group Access Controls link. 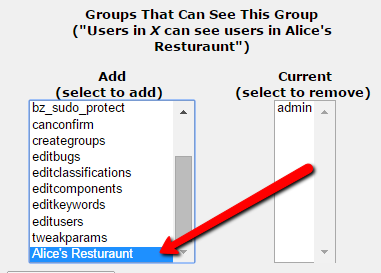 This allows the Assign To and CC to be populated with the Group users. Navigate to the search users screen. To create a new user click add new user. Enter Login name, Real name, Password. Check the box in the second column next to the Group they belong to.